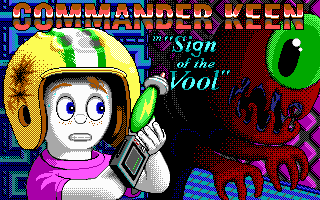 Commander Keen in "Sign of the Vool" is a Keen:Galaxy Source mod which takes place after my unofficial "The Universe is Toast" series. This is a single episode adventure. This time, Billy Blaze is personally the target of aliens from out of this world! What terrible plans could they have for him? 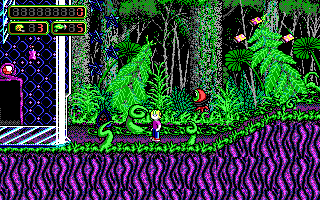 Follow Commander Keen to the dreaded planet Yuggossus for the answers he seeks. 1. To feel like a genuine, standalone episode in the Commander Keen saga that meets or exceeds the production value of the originals. 2. To add new gameplay features such that this feels like "Commander Keen with new features!" And not "Some other game in a Commander Keen wrapper..."
I am the primary developer of this project with graphics, level design, story and overall project direction. Lemm is the developer of the Keen:Galaxy Source Modding Package and programmer for this project. He implements all the awesome new features you'll see and also contributes creatively to how those features take shape. Nisaba, while not in an official role, has been invaluable with providing modding resources and assistance, bouncing ideas off of, and general motivation. I'm looking for a musical composer for the project. If you are interested please reply here or send me a message. Sign of the Vool will have more content than a traditional mod. More levels and more graphics: more tiles, backgrounds, enemies, and story images. Of course, more isn't always better, and I'll be working to ensure everything extra has a reason to be in the game and deserves to be in the game. The creature behaviors in Sign of the Vool will all be designed from the ground up, instead of being based on the behaviors of old enemies. I'm hoping this will really give the mod a fresh, original feel. Sign of the Vool takes place on the ancient, horrible planet Yuggossos, located in a region of space few dare venture and generally considered really awful, the Dread Nebula. This setting is heavily inspired by the exotic wilderness of Keen 4, the weird environments of 6, and the ancient isolation of Keen 1. Major inspiration outside the official games includes Commander Spleen's Orbkeen, classic/retro science fiction, and the literary works of H.P Lovecraft (as well as the fanart generated from it). The primary antagonists in this episode are the Vool, an enigmatic race of boogiemen from another Galaxy. Few have interacted with or even seen them, and nobody wants to. They're unpleasant and have a complete disregard for beings outside of themselves. The Vool will contribute a technological aspect to the environment which takes inspiration from Keen 5 as well as some of the structures of Keen 6. Outside the official games, the Vool are inspired by the Collectors in the Mass Effect series, H.P Lovecraft, and the Mars Attacks trading cards of the 1960s. Sign of the Vool will have some changes made to the classic Keen Galaxy gameplay. Some of these will be additions, but some will also be changes to the original formula. When Keen dies, his score gets reset to when he started the level. No more using lives to boost your score. This means the game will have a maximum point value, a perfect score to achieve. Not everyone cares about points, but I think this is a more interesting, compelling reason to collect them. Keen;s stunner will have a maximum charge. No more running around with 40+ ammunition and blasting anything in your way. Ammo conservation and collection should be a compelling component of gameplay. This will take fine tuning to get just right, I hope to test it extensively. The purpose of extra lives will be revised, and by extension, the possibility of game over by loss of all your lives will be removed. Lives and game overs seem to be an artifact of arcade games that just needn't be included in an adventure platformer like this. For now, what will replace the old system will remain a surprise. The difficulty settings will be revised. The new system here will also be a surprise. And one or two other gameplay surprises. Current Objective 4/22/18: complete levels 1-3 and present the community with a demo video. Sign of the Vool is a Keen 4 mod. The above screenshots are mockups, I haven't started level design. A foreground tiles are functionally done, all that remains are 'novelty tiles' to make things pretty. Backgrounds are hardly done, what you see in the screenshots is about all their is so far. Only one enemy is complete, but I have concept art for 50% of the cast. Story is pretty loose at the moment; it takes place after Keen 9, Keen travels to the Vool homeworld to put an end to their plot. Last edited by Ceilick on Sun Aug 16, 2015 6:21, edited 2 times in total. Ah splendid, splendid. I really like how the creatures and the point items are looking. I especially like how the status box looks. The green blaster gun is quite awesome. I'm not a great artist, but please let me know if there's anything I can do to help. @Ceilick: if it takes place after Keen 9, is it Keen 10 or not? This is not Keen 10. Ceilick wrote: This is not Keen 10. So this mod doesn't have episode number anymore, but takes place after Keen 9.
and he's at it again this should be real good, keep up the great work and congrats on all that has come before dude! Ceilick, I'm loving the look! this looks beautiful, almost Splenic in its use of colour. 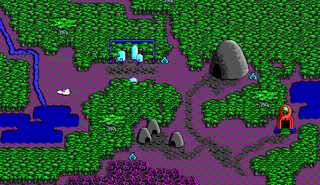 The background has a richness seen among EGA games only maybe in Cosmo. I am in love. You are one hell of a modder, it is plain to see! Just amazing. Truly amazing and beautiful. Upon loading this page, my heart stopped briefly. This is insane, it looks great! Looking good. Personally I'd put more emphasis on the items to distinguish them from the background, like a glowing golden circumference akin to the candy bars in K4. If you need co-story-builders, do contact me. Wh-wh-wh-what am I looking at? As always, if you need anything, you know how to contact me. I can try to help out where I can. How are there so many mods with such ridiculously incredibly graphics in development at the moment? Keen mods are looking better than they ever have.